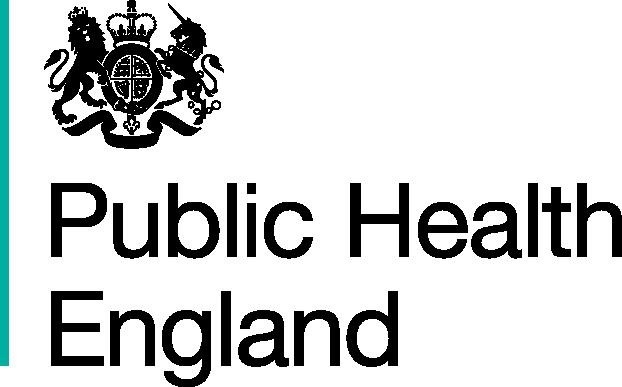 Public Health England last week became the first national government agency to endorse e-cigarettes as safer options for current smokers. Its report also dispelled several bogus anti-tobacco claims. Unfortunately, the PHE report overreaches in one respect. It says that “best estimates show e-cigarettes are 95% less harmful to your health than normal cigarettes,” and this became the dominant media headline upon the report’s release. To be accurate, PHE should have reported that e-cigarettes are far less harmful than combustible cigarettes, without specifying a percentage; there is no hard data to support a number. The 95% is derived from the reported opinions of a group of international experts in a publication last year. The opinions were merely “guestimates”. In truth, the health risks of long-term vaping are not known, and they are at this time unknowable. While there is universal agreement among tobacco research and policy experts that inhaling a vapor of propylene glycol, nicotine and flavoring agents is vastly safer than inhaling smoke containing thousands of toxins, the precise risk differential is unknown. I routinely criticize e-cigarette opponents for violating scientific principles when they make outrageous claims against the products. Recognizing that the PHE report is a welcome endorsement of tobacco harm reduction and e-cigarettes, I am disappointed that its value is at all compromised by a comparison that cannot be scientifically validated. 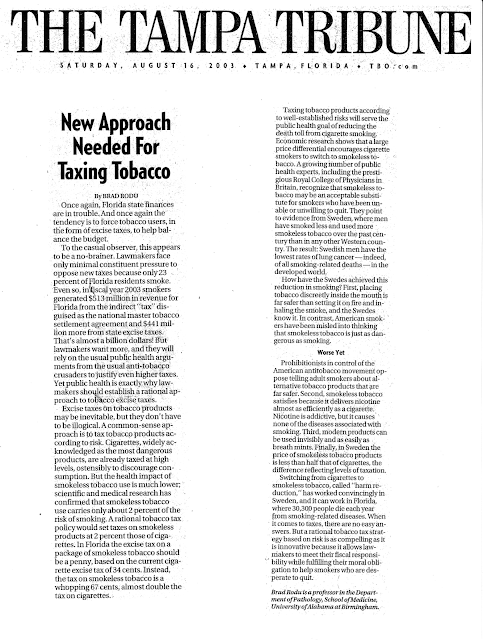 On August 13 the New England Journal of Medicine published a commentary (here) by three prominent tobacco research and policy experts challenging “national, state, and local policymakers” to “expedite the move away from cigarette smoking” by basing tobacco taxes on health risks. They recommend high taxes on high-risk combustible products, and lower taxes on low-risk smoke-free products like e-cigarettes and smokeless tobacco. I made the same argument in a Tampa Tribune op-ed on August 16. 12 years ago. “Taxing tobacco products according to well-established risks will serve the public health goal of reducing the death toll from cigarette smoking. Economic research shows that a large price differential encourages cigarette smokers to switch to smokeless tobacco. A growing number of public health experts, including the prestigious Royal College of Physicians in Britain, recognize that smokeless tobacco may be an acceptable substitute for smokers who have been unable or unwilling to quit. They point to evidence from Sweden where, over the past century, men have smoked less and used more smokeless tobacco than in any other Western country. The result: Swedish men have the lowest rates of lung cancer -- indeed, of all smoking-related deaths -- in the developed world. Twelve years later, it is comforting to see this taxation strategy gaining wider currency. You’re probably not familiar with Jordan, Minnesota, a town of 5,500 southwest of the Twin Cities. The Jordan city council voted a few weeks ago to ban e-cigarette use indoors and at public gatherings. Local governments throughout the U.S. are taking similar action, most of which is influenced by a sophisticated misinformation campaign. A July 11 letter in the Jordan Independent (here) perfectly illustrates the role of the American Cancer Society as a principal driver of the effort to deny smokers information about and access to safer cigarette substitutes. The letter, from an ACS volunteer, thanks the council for the ban and parrots standard exaggerations and falsehoods: e-cigs deliver toxic formaldehyde in higher amounts than smoke, threaten children’s health and don’t help smokers quit. I have written extensively about the 30-year ACS smokeless tobacco misinformation campaign (here, here, here, here, here). Now that organization is using the same tactics against e-cigarettes. ACS volunteers nationwide follow a script that demonizes all forms of tobacco, the companies that market them and the people who consume them. According to Charity Navigator, the American Cancer Society in 2013 received $878 million in contributions – nearly a billion dollars for their perceived fight against cancer. In reality, a good portion of that largess was squandered on their dishonest and harmful tobacco prohibition crusade. Last month, the Washington Times reported that the National Institutes of Health “spent $2 million [in research over three years] to have wives nag men about chewing tobacco.” I was quoted in the story, saying that’s a case of “big government intervention for a small-risk lifestyle choice.” I have documented that the NIH is spending hundreds of millions of dollars on “research” to counter tobacco harm reduction (here). While there is little that can be done to stop this misuse of taxpayer dollars, pressure can be brought against the American Cancer Society. It is time for tobacco users, their families and friends to send a message to the American Cancer Society: “Say goodbye to our donations.” Tell ACS volunteers in your community that the society must acknowledge scientific facts and abandon its tobacco prohibition stance. Until the ACS tells the truth about tobacco harm reduction, charitable contributions should be directed elsewhere.